Beaches In Kenya – Which One Will Be Your Favorite? Review of Beaches In Kenya – Which One Will Be Your Favorite? Beaches in Kenya come in all sorts and shapes. 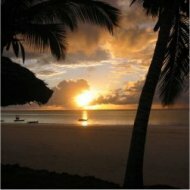 This page has the details on the most important Kenya beaches to helps you choose which one to visit. Below, I'll review Diani, Tiwi, Shelly, Nyali, Kenyatta, Shanzu and Kikambala Beach. Despite their differences, all beaches in Kenya have the almost archetypical tropical paradise setting: ever shining sun, soft white sand beaches lined with palm trees, and resorts with all the luxury you want. But read on my page Kenya Beach: The Other Highlights why the coastal population, culture and sights are also highly interesting! All beaches in Kenya are public – only some paths leading up to them are privately owned. Basically, you have the beaches north and south of Mombasa. The northern beaches were developed earlier because a bridge ensured easy access, and are on the whole still busier than the southern. The northern beaches are typically very long with a lot of hotels and resorts. But on the south side – accessible through the Likoni ferry – Diani Beach has catched up on them and and it’s now the principle package resort on the Kenyan coast. Meanwhile the busiest of all beaches in Kenya with a lot of beach hotels, resorts and activities such as water sports, camel riding, boat tours, etc. The reef is only a 30 minute swim of 10 minute boat ride away from the beach. It isn’t very "Kenyan" – although still far more exotic than your average Mediterranean holiday beach – but it sure is a lot of fun. If you are looking for comfort and lots of things to do, and like the bustle, it has lots to offer. You can also use Diani well as a base for exploring the region, since the inland national parks and other points of interest are close. But if you're into quiet, secluded places and roads less traveled, then better skip Diani. A good thing about Diani is that the level of security has gone up, with many askaris (guards) at the beach and even more at the hotels. Because of this, most beach boys and hustlers have moved elsewhere. On the other side, the beach tends to get covered largely or entirely during high tide. A lovely, quiet beach that hasn’t been overrun by hordes of tourists yet. Apart from the large Tiwi Beach Resort on the southern end, it only has small cottages and no big beach hotels or resorts. Except around the Tiwi Beach Resort, beach boys and panhandlers are absent, although some places are visited by a few friendly locals offering foods. It’s a also a great and safe spot for swimming, since the reef is very close. The other side of the coin is that there are few restaurants and organized activities. This needn’t be a problem, since most cottages have their own small restaurants, cooks and/or self-catering facilities. But it’s clearly a beach where you want to go if you’re looking for some real peacefulness. While all cottages and accommodations will have private guards around the clock, and the beaches are safe during the days, you should avoid walking around alone outside of them even during daytime – it’s a secluded area. This beach gets it’s name from it’s shells. It’s strong point is being very close to Mombasa – after taking the Likoni ferry you can get there with a matatu bus for KSH 30. You can swim at Shelly Beach during high tides, but there’s a lot of seaweed. For the rest, other beaches in Kenya have more to offer. Nyali Beach is the first beach to the north of Mombasa, and easily accessible from there. It’s a long straight stretch mainly taken up by hotels. Some of the most popular North Coast beach hotels are located here. The shopping centre at Nyali has a big Nakumatt supermarket, an internet café and a good book store. The reef located 2 kilometers from the beach, has created a kind of lagoon, which makes it a good place for kite surfing and other water sports. A lot of activities are offered both by the hotels and other vendors. Bamburi Beach is known for it’s good restaurants, huge hotels and busy nightclubs. Water sports like scuba diving, snorkeling and water skiing are offered by the hotels, while locals offer camel rides on the beach and dhow sailing trips (dhows are traditional vessels). Local vendors on the beach can be very persuasive. If you need to buy anything that’s not available on the beach, the Nyali shopping centre (see above) is usually closest. Kenyatta Beach, next to Bamburi Beach, is very popular. Of all beaches in Kenya, it’s about the only one where you’ll see large groups of Kenyans by the seaside. While there are a quite lot of beach boys and hustlers, it’s generally a fun and (family) friendly place to be. During low tides, a large area is uncovered, filled with coral pools and suitable for walking. Sailing boats are offered for hire as well as other activities, and local vendors sell ice cream, drinks and snacks. Further up north, Shanzu Beach (as well as Kikambala) is too far from Mombasa for a day trip. It’s dominated by the luxury resorts of the African Safari Club chain. It often inspires mixed feelings: on the hand, the beach itself is lovely. On the other hand, most places here are little more than tourist traps and the areas outside the resorts are filled with beach boys, panhandlers and working girls, sometimes masquerading as ‘massage’ girls. It’s most important attraction are the Ngomongo Villages, a theme park that depicts Kenyan traditional life through mock rural homesteads inhabited by traditionally dressed people, artists and a score of activities for the visitors. It’s not very authentic, but it is entertaining. Located in flat and thick forested area, Kikambala Beach is the first low-budget beach north of Mombasa. During low tides, the sea retreats about a kilometer and it’s only possible to swim with high tides.